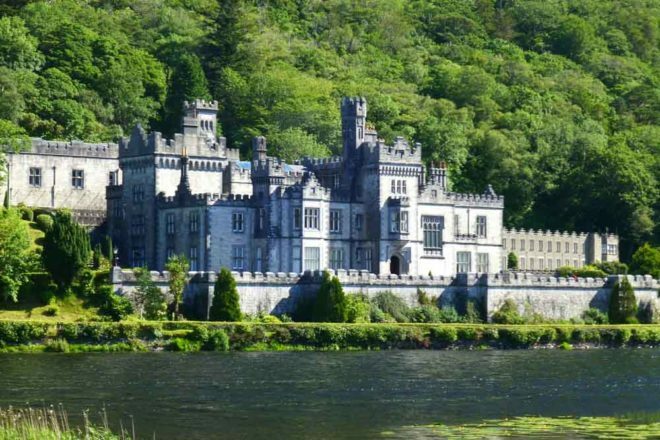 The spectacular Kylemore Abbey on the shores of Pollacapall Lough, Ireland (photo: Quentin Long). The charismatic King of Tory is ready to greet all arrivals to his kingdom (photo: Quentin Long). 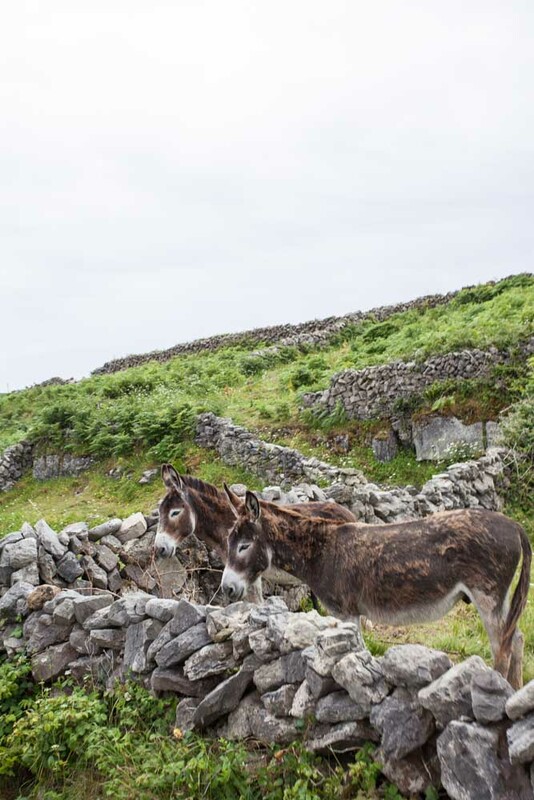 Donkeys graze on the green pastures of Inis Mór (photo: Quentin Long). 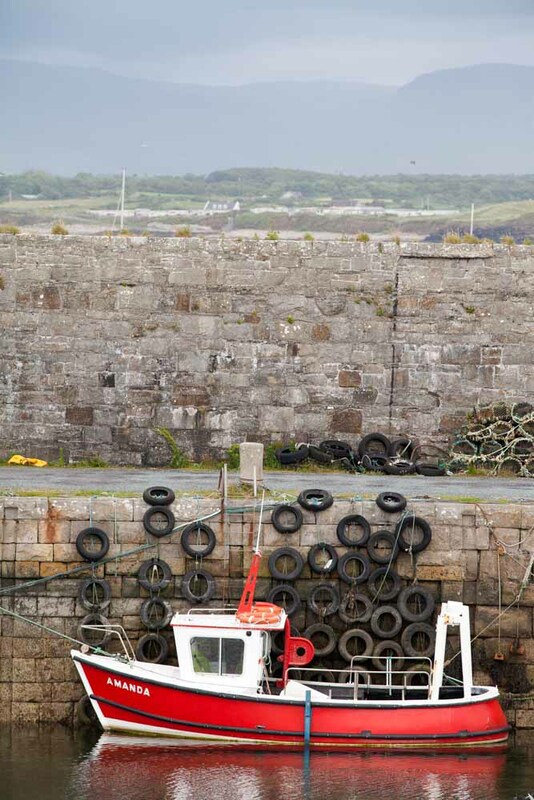 An old boat on the island of Inis Mór, weathered like the Island (photo: Quentin Long). 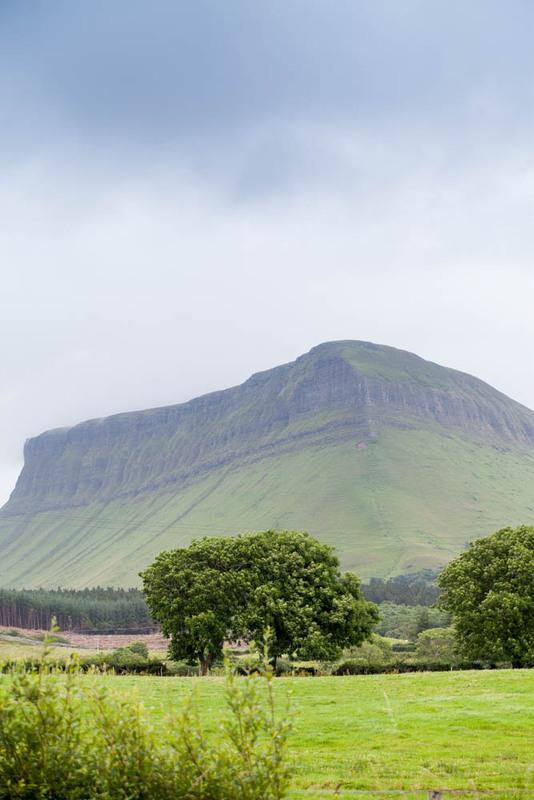 The colossal Benbulbin rock formation in County Sligo, Ireland (photo: Quentin Long). 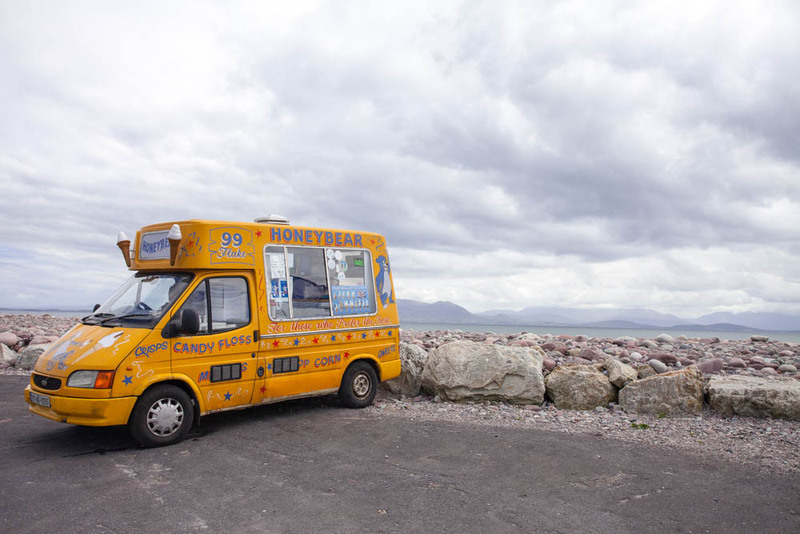 Ice cream with a view; in Mulranny, Ireland (photo: Quentin Long). 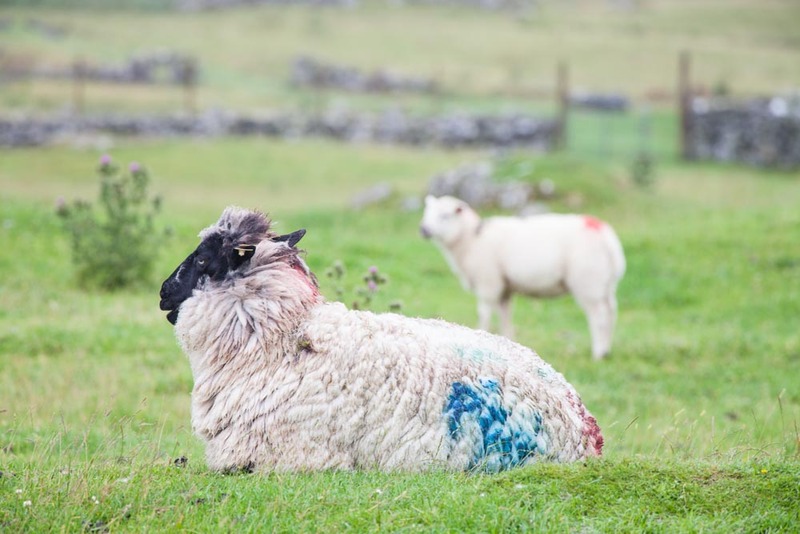 You’ll see plenty of these sheepish chaps around Ireland (photo: Quentin Long). Stop to warm up with cake and tea at Teach Nan Phaidi, a pretty restaurant in Inishmore (photo: Quentin Long). 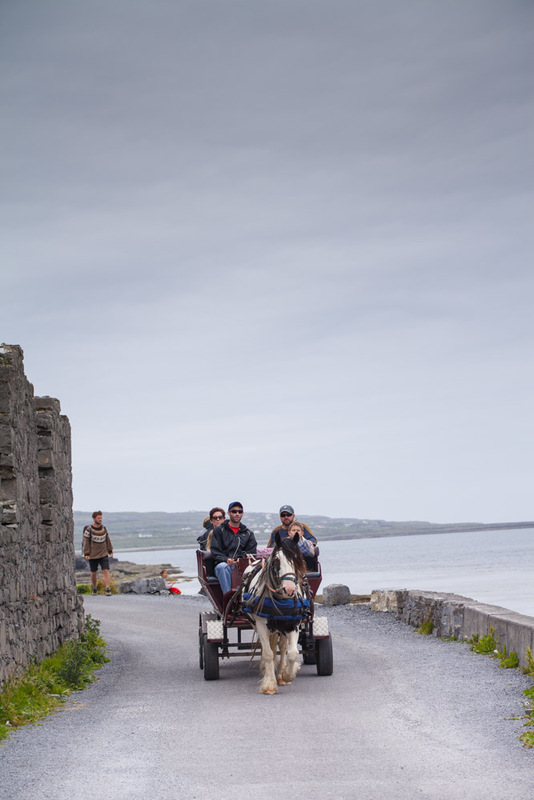 Tourists take a horse and trap on Inis Mór, it's a great way to see the island (photo: Quentin Long). 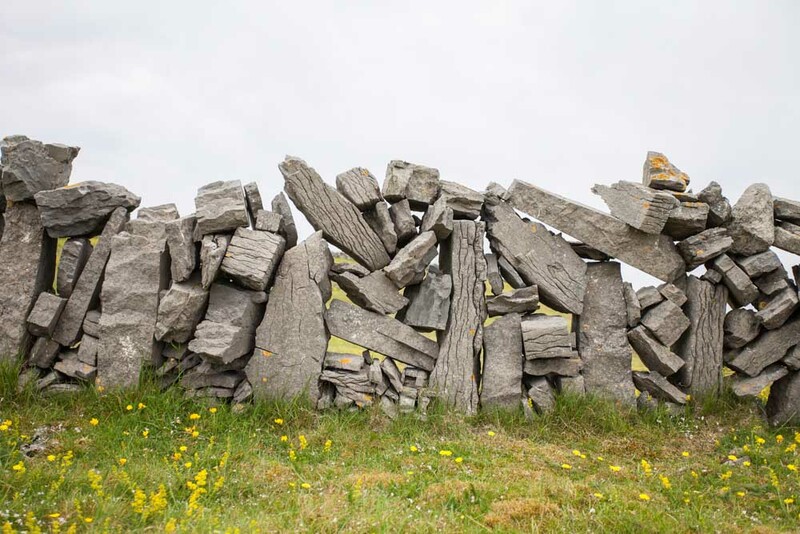 An imposing dry stone wall on Inis Mór (photo: Quentin Long). A truly unexpected Ireland can be found on the wild Atlantic islands along the west coast, where the country’s only king rules. Words & photography Quentin Long. I’m not sure how to greet a king. I’ve met governors-general and governors, and that protocol I know: Your Excellency. But there is no protocol officer for the King of Tory Island, the only king in Ireland. What I do know, however, is that I am the best dressed prospective visitor the King is likely to have today. I am standing on a rickety ferry noisily grinding and belching the 14 kilometres across the Atlantic from County Donegal, wearing a shirt ironed by my B&B host and a suit jacket I have carted across Europe. My fellow passengers are walkers in various forms of Gore-Tex active wear and a gaggle of kids from an Irish music band, their fiddle cases and other instruments wedged in between crates of vegetables and palates of fruit. I have travelled quite a distance to meet 72-year-old Patsy Dan Rodgers, the current King of Tory. The previous day it had taken me 11 hours to drive what is typically a four-hour journey along the north-western coast of Ireland because I kept stopping to take it all in. Instead of the lush rolling hills one might expect, I traversed a land far more dramatic and severe, my preconceptions of this country completely at odds with the wild landscape. However, there were some typical Irish moments along the way. At the awe-inspiring Killary Harbour, one of three fjords in Ireland, I spot a tree wrapped in cloth offcuts with children’s toys tied to its slender mast: a fairy tree. Its mystical powers dictated that the highway be laid with a slight bend to ensure it remained unscathed. Then, at the other end of the crazy scale – the instability caused by love and devotion – I spent a leisurely couple of hours at Ireland’s version of the Taj Mahal, Kylemore Abbey. Its builder, Mitchell Henry, had a mini gothic cathedral constructed as a memorial to his beloved wife. It is strangely breathtaking. Docking at Tory, Patsy cuts a lone figure in black. He greets all new arrivals to his kingdom. His fingers are adorned by gold rings that glint in the sunshine, but that is as close to regal adornment as he gets. Under a modest sailor’s cap, his wizened old face breaks into a wide, easy smile with each greeting. As with all things Irish, the King of Tory isn’t a typical royal appointment in that it’s a democratically elected position. Dating back to the sixth century, legend has it that Saint Columba arrived on Tory to convert the pagans. A local man, Duggan, was given the title of King by Saint Columba and told that if he resisted the pirates that were pillaging the area he would defeat them and their small island would be at peace. Saint Columba’s prophecy was correct and as a result the islanders swiftly converted. Since then the King of Tory has always been elected by the islanders. Once every passenger has been greeted Patsy invites me on a royal tour in his old Peugeot. Not all the doors open and the front bumper bar with its King of Tory number plate was lost years ago (the back one is still intact). It’s not going to be a particularly long tour because the windswept island is only five kilometres in length and one kilometre wide. Home to around 130 people, there are four ‘villages’, some of which only received electricity 10 years ago, one grocery shop that doubles as an art gallery, a pub that is only open in the summer and a few artists’ houses that act as studios. Patsy is an artist and musician himself. An ancient bell tower stands over the tiny harbour. It is the only remnant of a monastery established in the sixth century and destroyed by the English in 1595. On the north-eastern edge of the island is the mythical fort where Balor of the Evil Eye imprisoned his daughter. The myth goes that Balor was frightened by a prophecy that he would be killed by his grandson, so used the fort as a severe chastity belt. The area is accessed by a small isthmus and protected by 90-metre-high cliffs on its three sides. Puffins and guillemots inhabit the cliffs and are a source of constant activity. As we drive, Patsy reminisces about his own coronation. Throughout our drive he greets everyone we meet. I came here seeking a quirky island experience, but it is tinged with sadness. Tory’s way of life has long been lost to the rest of the world. It’s “Ireland 50 years ago” according to my B&B host. Now cherished by only a few Irish linguists and musicians, its future is precarious. 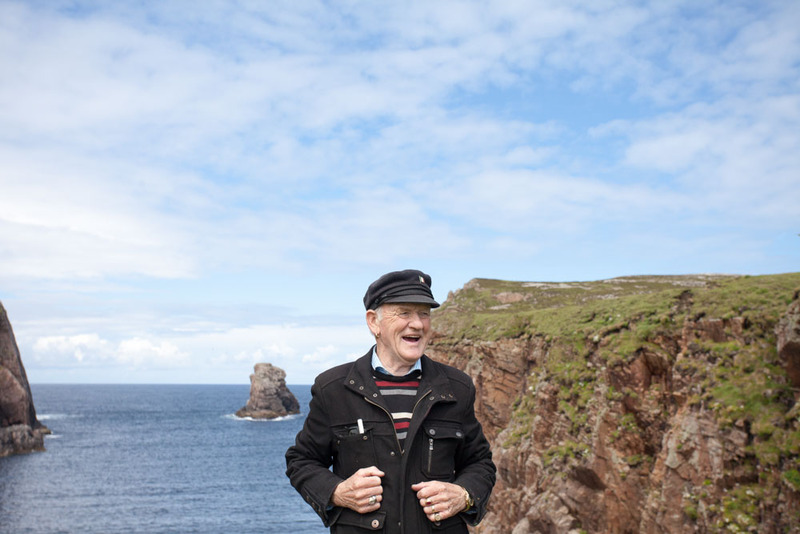 In what is considered a remote corner of Ireland, visitors are the only source of income. Patsy cares deeply about his people and his island; he would hate to be the last King here. Six days before my ferry ride to meet the King, I boarded another ferry for one of the most famous and one of the most visited islands of Ireland. The largest of the three Aran Islands, Inis Mór (Inishmore) sits in Galway Bay on the west coast and is a relative success story thanks to the huge number of day trippers who come for the walks, the historic sights and, of course, the famous jumpers. As we disembark at the largest town, Kilronan, a boyish teenager is holding a sign with my name. He introduces himself as Fionn before eyeing my bags. It was a poor decision to bring all of my four-weeks-in-Europe luggage. Fionn and his horse Minnie are taking me around the island in his ‘trap’, a cart that resembles a bath tub attached to a horse. But in typical Irish ‘can do’, it all fits. I have arrived on one of the few days where traffic on the island, population about 1200, is a challenge. The kids of Inis Mór have swimming lessons for two weeks every year and today’s drizzle and cold breeze doesn’t deter them as they frolic in the grey waters. Escaping the ‘gridlock’, Minnie mooches to the southern tip of the island then heads north past lush, wind-blasted fields tattooed by the dry wall fences that demark various claims to land. Fionn notes the remains of a 16th-century castle used by Oliver Cromwell’s forces. Tourists take a horse and trap on Inis Mór, it’s a great way to see the island (photo: Quentin Long). In the distance, on the highest point of Inis Mór another tower sits prominently. Built in the early 19th century the lighthouse was too far from the shore to be seen by passing ships and therefore abandoned shortly after shining its first light. How Irish. Fionn and Minnie leave me at Kilmurvey township, a huddle of half a dozen buildings with traditional thatch roofing, with instructions on how to find the best lunch on the island. Between mouthfuls of fabulous smoked mackerel and salad followed by a chocolate and Guinness cake at Teach Nan Phaidi, a pretty little cottage, I notice that 50 per cent of the diners are speaking Irish Gaelic. Inis Mór and the Aran islands are a stronghold of the Irish language and are bestowed official Gaeltacht status meaning Irish can be used in all services including schools. Fionn’s father, Cyril O’Flaherty collects me from the cafe, greeting several of the fellow diners in Gaelic. We are off to explore one of the Bronze-Age forts that most people come to see on Inis Mór. Dún Aonghasa (Dun Aengus is the anglicised version) was constructed in several eras, the first in about 1200BC and the last of the walls about 500BC. The formidable defences, a cheval de frise, is something to behold. Large stone slabs and rocks are arranged in an uninviting series of jagged edges and sharp corners outside the third wall creating a debilitating obstacle to any foe. As we head up the hill toward the fort, the rain has picked up and Cyril quotes his grandmother: “You’re neither sugar nor shite; you won’t dissolve or wash away.” That is the Irish attitude. As the small ferry chugs closer to the mouth of the small harbour of Inishbofin, the next island on my agenda, the largely intact remains of Cromwell’s barracks loom into view. An intimidating structure, it was used to warn off would-be attackers and imprison Catholic clergyman. Today, the island plays host to a small group of families who holiday here in the summer months: locals can tell which week of July or August it is by which families have taken up residence. While here they go walking, visit the beaches and enjoy the craic at the pub, The Beach – Days Bar and B&B. The rest of the year the population dwindles to 190 or so. The rain has set in for the day. Thankfully, I find the island’s only taxi offers tours. On its eastern edge is a stretch of white sand on a beautiful bay imaginatively called East Bay Beach. The rest of the island is bucolic countryside with the occasional sheep and cow. Inishbofin is in the middle of something of a renaissance, building on its natural assets and stepping up its eco credentials. Retreating out of the rain to The Beach pub I meet one of the architects of the revival, Jackie Jefferson. A vet by trade and wanderer at heart, she left her life in the UK to cycle around Turkey, eventually finding her way to Ireland. Landing on Inishbofin and planning to stay for two nights, she never left. “It’s another world. I got off the boat and said ‘Oh gawd, I’m never leaving here’,” she says. Finding her second husband on the island she then developed the Dolphin Hotel, which hosts a series of eco tours. She is now also championing the efforts for Inishbofin to become the very first Fair Trade Island. Later that night, I share a decent craft beer, The Bofiner, with The Beach’s owner Adrian, another interloper. Adrian married a fourth-generation ‘Bofin’ islander girl and, using his five-star hotel background and contacts, set about the careful development of Inishbofin. The Bofiner is a perfect case study: created by a celebrated indie brewer in Cork, the profits go towards a fund that Adrian hopes will establish a brewery on the island. “It’s about giving the youth a reason to be here, so they can create a real business here,” he says. In six days I have found three very different islands in three different stages of their human habitation: the runaway success of Inis Mór; Inishbofin, building on its natural assets; and Tory where Patsy is hoping to secure a succession plan for the future of his kingdom and, most importantly, his people. Getting there: Emirates operates 77 flights a week from Australia to Dubai from Brisbane, Perth, Melbourne, Adelaide and Sydney, with twice daily connecting flights to Dublin. Driving there: My route followed the northern half of the Wild Atlantic Way. This spectacular coastal road stretches more than 2500 kilometres along the entire west coast of Ireland, both the Republic and the six Northern counties. 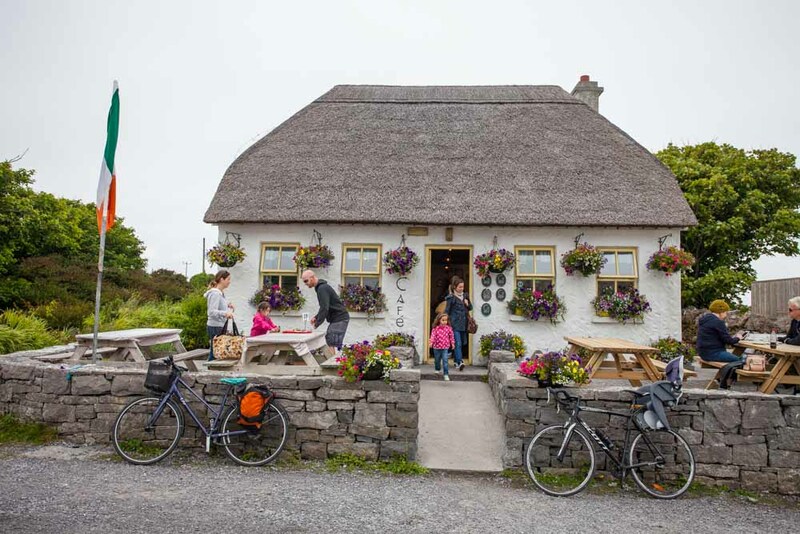 Wild Honey Inn, Lisdoonvarna – One of the best pub restaurants in Ireland, with lovely cottagey rooms a stone’s throw from the Cliffs of Moher. Hotel Meyrick, Galway – A grand old Victorian hotel that sits right in the heart of the city. The Beach – Days Bar and B&B – Simple rooms behind the pub, great for falling into bed after a session with locals, and good hearty food.